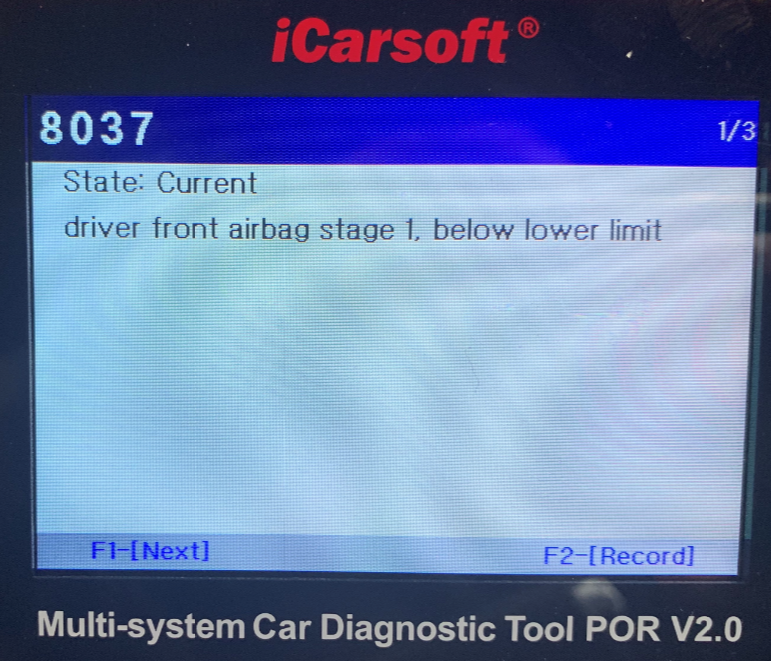 911uk.com - Porsche Forum : View topic - Air Bag, Below Lower Limit ??? 911uk.com Forum Index > 997 (2004 - 2012) > Air Bag, Below Lower Limit ??? 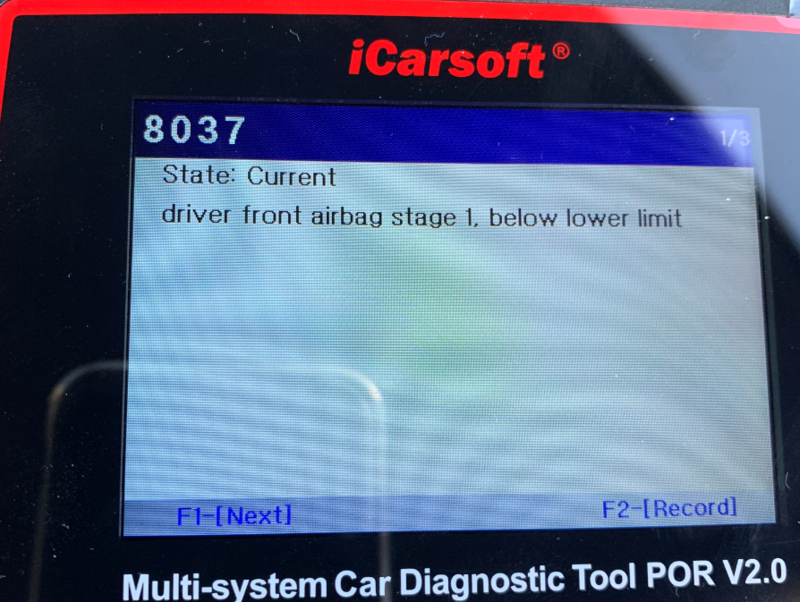 Posted: Fri Jan 25, 2019 6:34 pm Post subject: Air Bag, Below Lower Limit ??? The fault pictured below was shown, all reset and its not reappeared after a short drive. Have you changed the steering wheel recently ? Have you removed said wheel recently ? 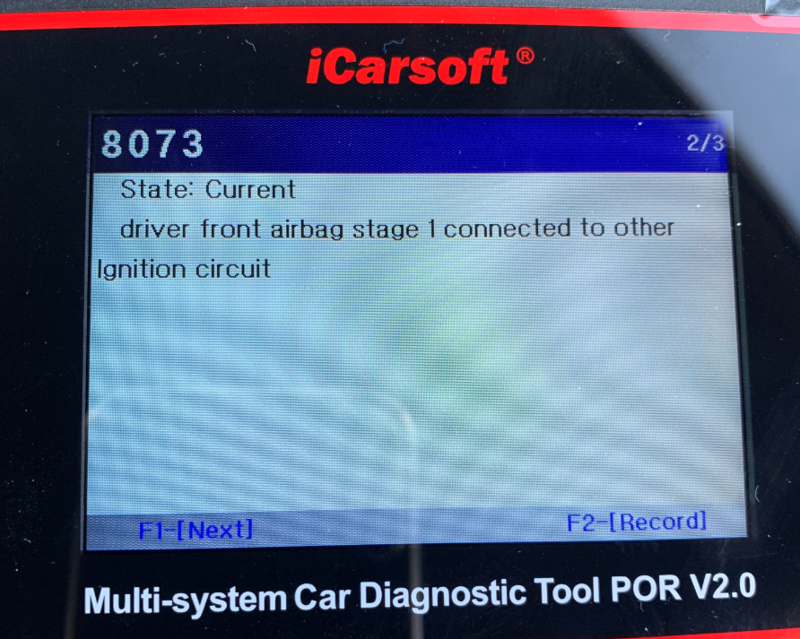 Fault code refers to the airbag in the steering wheel .. it could be the clock spring or the airbag wiring .. never seen this code for an actual airbag fault though . The airbag has 2 stages for minor and major accident , only one stage has flagged a fault . My usual experience of this is when the wheel has been removed and the airbag plug has not been refitted properly .. there are a green and an orange plug on the back of the airbag , not sure which is stage 1 though . No the steering wheel hasnt been touched in my 20 months of ownership. The only thing that I have done recently that is out of norm is connect it up to a trickle charger (via the cig connector) as the battery recently died. Code has cleared so monitor it for now .. if the light comes back on i would lean towards the clock spring (the wiring that connects the airbag to the car ) but this is only a hunch and you would need to get it checked out . Just a quick update, the airbag light did come on again after a few days after a reset, I have captured all 3 screens this time and posted below. Car is booked in to OPC Hatfield on Monday 11th March. Car is reaching the end of its warranty in May and not sure if it will be covered, Shall find out when its fixed I guess. An educated guess .. or just a guess depending on how you look at it ..
Its a wiring short and i would suspect the clock spring .. its the connection to the airbag has shorted out . I cant see it being the airbag itself . Its not a code ive seen before. As its booked into an OPC ill not investigate the fault codes any further .. but i do like to have a go before something is proved and thats for me im afraid and not you .. I get strange faults at work .. i often have to rely on instinct for want of a better word to know were to go ..
Faults like this help me become better strange as it may seem as after the fault is fixed (and you let us know ) i can analyse how i think about these systems . I do actually use the forum as a training excersise to be honest .. thats what i get from this anyways . Thanks for your reply deMort, I'm like you but not as eager as I once was, if something was broken then I would always be there to try and fix rather that pay for someone else to do it. Well dropped off the car today as planned, apparently no fault was found and codes reset, taken for a test drive and nothing triggered the fault again. But they gave the car a health check and found a bit of play in a track rod end, I said that they may as replace the pair and do a wheel alignment as the other will no doubt be on its way out as well. They also mentioned that the front pads will need replacing soon, and mumbled that I should also replace the discs at the same time, that can wait as I'll stick it in an indi or do them myself. So just waiting until tomorrow when he said he would email me the report before commencing with the track rods. I did mention to him that I posted a message onto a forum about the airbag light and maybe the spring between the steering wheel and the car was suggested as being the culprit and he was going to put this forward to the technician ! I await the call & email in the morning. Intermitant fault im afraid ..
i hate them .. we cant fix or test whats not broken .. it can be a slight resistance in a wire , it can be a software glitch .. either way its a pain and for once i have to agree with them .. i do hate doing that .. I would give the same advise .. see if it comes back .. with no permanent fault then we are into throwing bits at the car to try and fix it .. so its a case of monitor it and hope it either gets worse or doesnt come back . i suspect a clock spring fault but its not worth throwing money at just yet .. i cant after all see your car and even if i could .. no present fault and i cant confirm anything im afraid . Totally agree with you deMort, I'm not sure if I'm having the pleasure of paying for the investigation or not, but no doubt I'll find out soon. If there was no fault codes then they cant reset them .. cant clear a code thats not there .. also did you clear the fault codes after you read them out ? as if not there would have been a code and the normal action is to follow the test plan for said code . At the end of the day i cant see the car or work on it .. so what i come up with is only ever an educated guess im afraid . I didn't want to mention that I had reset them once and it triggered again some 2 weeks later, just in case they said it wouldn't be covered under warranty as I reset them. They did mention today on the phone that it may of been due to low voltage if the car hadn't been used much (which it hadn't, but still on the trickle charger) when I get it back I'll just see how it goes and I shall ask them again with what they found. I find their geometry charges a bit rich, TBH. Plus they don’t always knock off the discount for parts on older cars. That would appear to be the inner rack arms .. not the outer track rod ends , its not uncommon to have a small amount of play in these .. I found it strange for many years that some cars have the play and other similar cars dont .. we finally put it down to speed bumps as the cars from speed bump areas were always the ones effected by this . Ive never seen an excessively worn rack arm joint though .. ive changed plenty and you can do it with a 36 mm spanner .. special tool .. erm .. I can only asume who ever did the job has never done one before or even worked on many Caymans , boxsters or 997 as it happens on all of them , my assumption here is it was the apprentise .. yup im that suprised atm ... they have ordered a crows foot spanner basically . The cost though .. to be fair that doesnt do it justice so ..
Im gobsmacked as is everyone at work .. perhaps best if i just say an Indy is cheaper (not going to say what we would charge ) and you dont need a full geo .. you just need a front end adjustment . For the fault code for the airbag which they couldnt fix ..
A car on a trickle charger .. it wont have a low voltage .. thats the point of a trickle charger .. even so .. 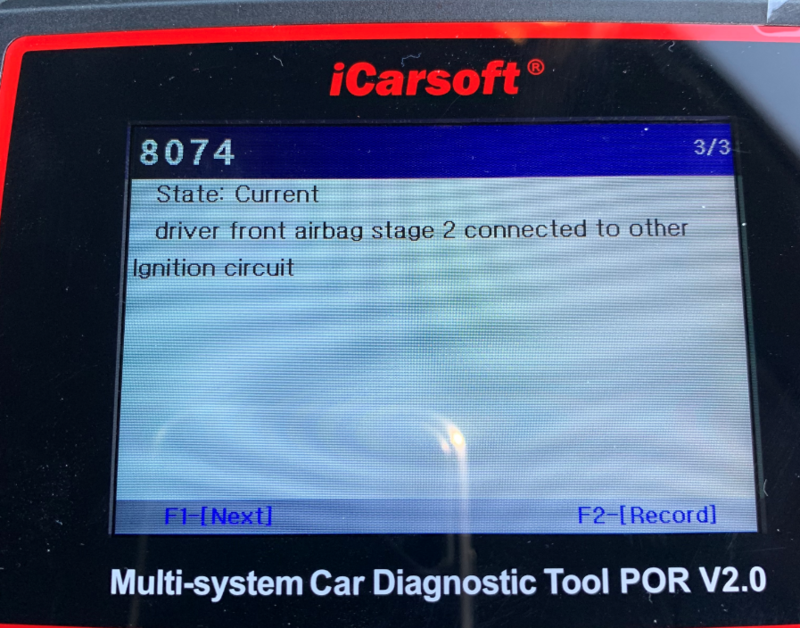 The car with the ignition on ( key in the lock ) does a self check of the airbag system .. this is when it may find faults .. also once moving it will continually make sure the system is fine , anything it sees no matter how quick it will flag a code , the light and shut down that part of the system . The car has no idea of any faults on the system untill the key is in the ignition lock .. hence i often change airbag parts with no keys in the ignition and i never get a light on which i would do if the key was in . You have an intermitant fault which may only happen for a millisecond but the car will see it and trigger the light .. this as you know can only be turned off by clearing the fault code . The shame is you will still have an airbag fault , im guessing it will come back in a week or 2 .. if it helps i showed this to one of my collegues today .. more about the cost they charged you but when he read it he said .. that sounds like the clock spring to me . Downside .. i cant see the car , its under warrenty anyways so all i can do is say what i think is wrong .. my guess is clock spring as is my collegues guess . Youll just have to monitor it for now .. sigh . 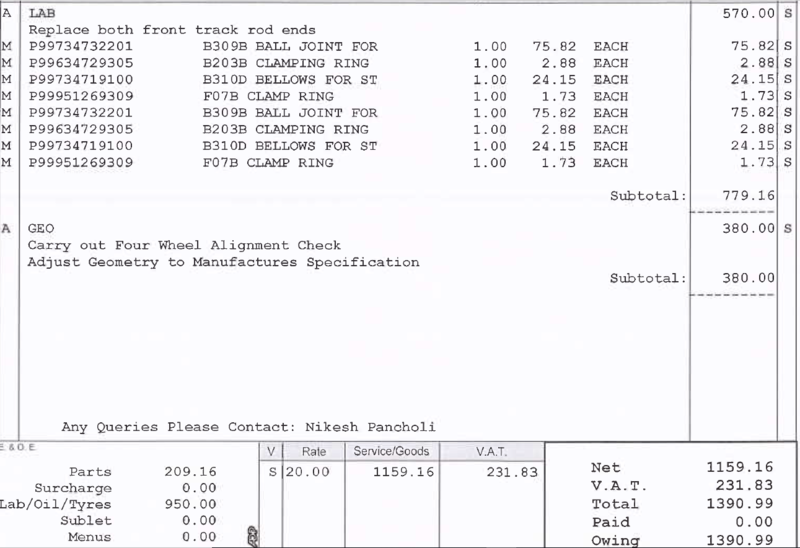 Is that £380 for a 4 wheel geo alignment!!! I'm not going to post just yet but the fees above have risen more, I have sent them an email asking them for some more details and I shall post here in due course. The car went in with an airbag fault on Monday and I'm hoping to get it back tomorrow (Fri) or ??? But after a 'Health Check' for a 'Bit Of Play' in a track rod end I'm going to be in the region of £1600+ lighter. Funny how this wasn't spotted in the MOT in Dec (some 200 miles before). This is the first time I have used an OPC for a repair and I'm slowly loosing faith in them for any future repairs. Feel free to email if you want to as i realise not everyone wants to post details on the forum or if needed ill happily pm you my number and we can chat on the phone . To be honest .. ive just made a thread in the general section about VHC ,s and im sorry to say .. this was my insperation for it . If you do have the video link from the VHC i would love to see it .. email above .